My friends at Knallgrau in Vienna have just launched their content sharing service Blogr.com. This is the alpha version but it already has nice features with more to follow – as well as the addition of other languages and extensions to target European countries (disclaimer: I’m in charge of the early marketing in France). They nicely acknowledged my contribution in their FAQ. Thanks guys! I don’t know how Olivier found this but it seems that London Business School got itself the first nasty gossip blog by a MBA Professor. Although there is good stuff in it (like linking the poor spring weather to the school future endowment through branded umbrellas), I was quite put off by things like unnecessary Dean-bashing (mocking an old picture from wikipedia and linking “current dean” to a page about “lame duck”) or the piece about “primal urges” – which could have been funny. BEEP! BEEP! Check out this guy! Well done to the admissions office - we found the hole in the net where they have been getting in. Quick patch her up and make space for normal people. While intended of course to be nasty and perhaps provoking to get me to reply and link to this site (the prof needs to boost its audience and visibility), these lines are actually not that bad. I’m used to be considered an original (fool & crazy would do too) and like it. This however raises the following questions: what is “normal people” and should they get in a top MBA? Bottom line, the mbaprof sounds really like a late April’s fool or the result of a lonely Windsor drinking night (in the absence of Sundowners last week due to MBAT). That’s too bad because I’d love to read a good blog by an MBA teacher. Someone inspiring like visiting Brand Management professor Mark Ritson or Negotiation & Bargaining Gillian Ku, who is closer to the student body – she was at MBAT this week-end. With just two days of post so far, it’s hard to tell if this blog will last and turn in the entertaining site Olivier is asking for. I’m just afraid this professor is too bitter and aggressive to deliver this. 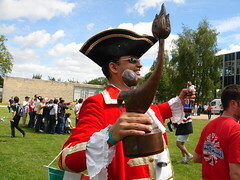 London Business School is finally bringing the MBAT trophy home after a clear historic victory this week-end. This was great fun and I am going to write a longer piece on these great 4 days on HEC campus soon – probably on the London Business School official blog which is coming soon and to which I’ve been invited to participate. Meanwhile, chant all with me! It’s better with Nash (on the picture) singing it or doing the infamous Bird Dance! PS- Were I to be late to post my account of the events, I’m sure the MBA2007 bloggers will have their version of this online soon (see KV for instance). That’s such a relief to finally launch the new appearance of Around the Dot. 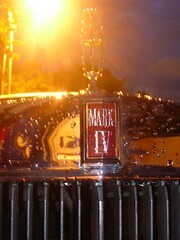 As announced last week, here is the Mark IV. The graphics were ready in an almost final version in October and it was intended to be launched during my stay in California, but this was so low on my priority list. Anyway, I hope you’ll like it and I hope to read your opinion in the comments or my inbox. I’m personally a big fan of the good old “mark” system which you don’t see around anymore. And so I announce Around the Dot – Mark IV for next week! Indirectly and in a fashion that has no direct incidence on your communication security (keys are long enough), Skype makes you pay for security. According to an external audit ordered by Skype whose results are available on Skype security page, Skype discriminates between basic users and those paying for advanced services. (…) there are two Central Server key pairs, one with a modulus of 1536 bits and the other with a modulus of 2048 bits. The choice of which modulus to use is made by the Central Server. It depends on whether the enrolling user has purchased any Skype premium services, e.g. SkypeOut. If so, the longer modulus is used. If not, the shorter modulus is used. An enrolled user who purchases a premium service for the first time will be issued a new IC, signed with the longer key. Cineworld, the UK's second largest cinema chain, will signal it plans to launch an initial public offering, becoming the latest private equity-backed business attempting to join the London Stock Exchange. Cineworld (previously Cine UK) made it really big by buying France UGC's theatres in the UK last year. This was in fact bad news for me as I was then using my French UGC “unlimited” movie card to go to London “UGCs”, something I could not do during my last month before I came back to Paris for the summer break. I had the opportunity to meet Cineworld CEO Steve Wiener when he came as guest speaker during the “Managing Entertainment & Experience” class I took in the Fall term. He is really a great and nice guy and the story of how he created Cine UK was captivating and covered many interesting topics of which were the unlimited card (which he thought was rubbish but had to continue after buying UGC), founding & funding (this came out of a consulting job and he was living on a shoe string while waiting for banks to sign the draft) and marketing & logo design (the least of his worries as both logo & name had to change a few times). Crazy “Intern in New-York” Andy is back with an entertaining “douche bag of the week” blog. I kind of liked reading his blog during MY internship (even at work, I confess) and this new venture seems to have potential. At least, I enjoyed this week double “douchebagging” of pseudo magician David Blaine and its NY crowd.